A crazy pre-swing dance especially popular in the 1920s, during the period of splendid garden parties. That period is also known as the Roaring Twenties. It is danced at 8 beats, its character given by a particularly cheerful skipping pulse. It has a very simple and adaptive essential step that allows the dancer to connect number of exciting figures, danced to fast and really catchy songs. The Charleston was developing by the 40s, when it enriched the Lindy Hop with new elements, to which many of its figures shifted. 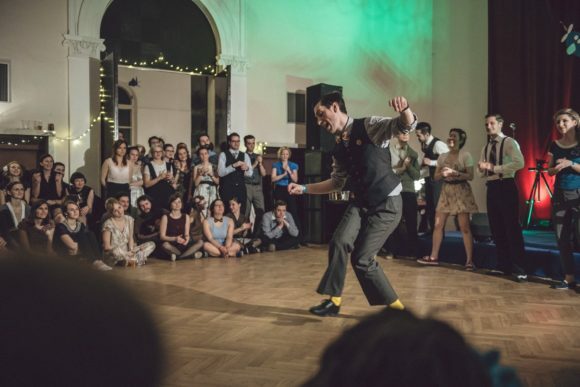 The Charleston’s advantage is that it can be danced solo without a partner and also brilliantly fits, in addition to authentic songs, with the current electroswing.